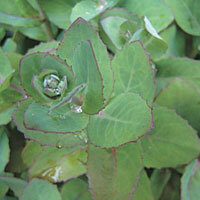 If you’ve seen one sedum, you’ve “sedum all”, a prairie horticulturist’s son was heard to murmur at a plant sale. In fact, though, you probably haven’t seen even half of them, because stonecrops come in such a wide diversity of types. 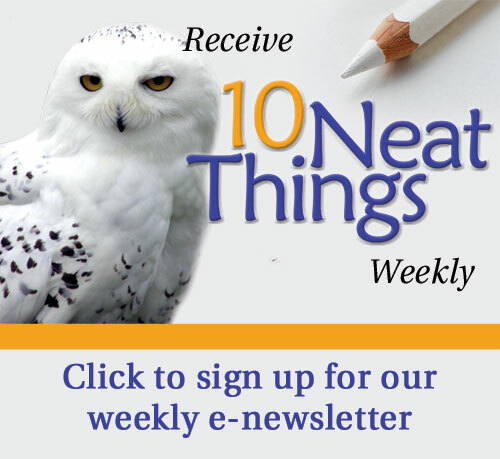 Plant habits range from ground cover to upright plants, while yellow, white and shades of pink or red blooms adorn the plants throughout the summer and autumn seasons. Leaves can be variegated, purplish, red or various shades of green and blue-greens. Sedums are a great plant group to grow in our prairie climate, as they rarely have pest problems and easily stand up to the dry hot summers. 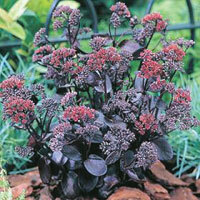 Hardiness varies but there is a good selection of sedums that withstand the rigours of our winters. Stonecrops comprise about 600 species in the genus Sedum, growing in their native range throughout the northern temperate zone and in the mountains of the tropics. The leaves are fleshy and often small. Plants are easy to grow and propagate (softwood stem cuttings, seed or division). They grow best in full sun and well-drained soils, although some species will do well in part shade and other soil types. The number of species and cultivars available is very large, with new types coming along yearly. 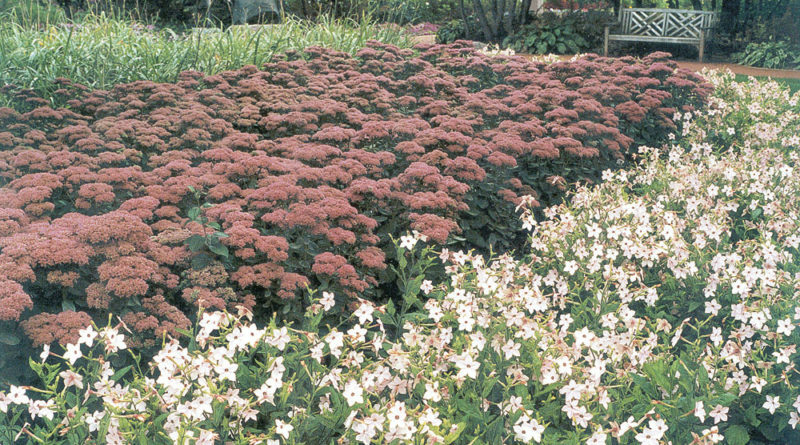 Probably the easiest way of getting to know sedums is to group them according to use in the landscape: ground cover, low-growing clump and mid-size clump types. The ground covers are spreading plants suitable for the front of beds, covering slopes and terraces or cascading over walls. 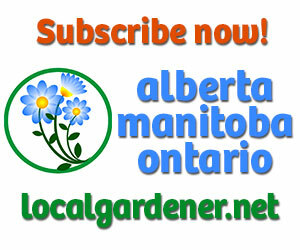 Many recommend them for rock gardens, but as they are fast growing they need lot of maintenance. Topping the list of rather aggressive ground covers is ‘Sedum acre’, also called golddust or goldmoss stonecrop. Plants have tiny, evergreen leaves and bright yellow flowers, are two to three inches in height in summer, while its cultivar ‘Aureum’ has bright yellow leaves. Be aware where you plant this species, as it soon will be everywhere. That said, however, it does fit in well when planted in a sunny location between stepping stones, where it will readily fill in empty spaces. 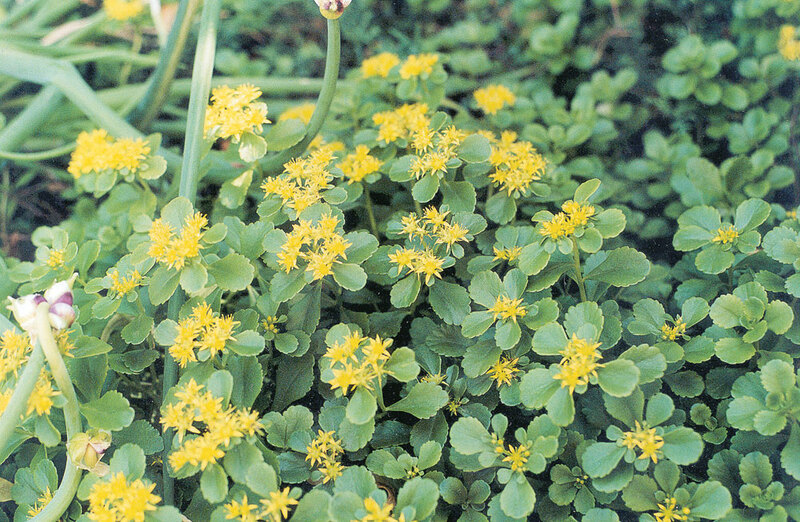 Sedum spurium (two-row stonecrop) is probably the best known of the groundcover types because many cultivars, with showy flowers, are widely available. 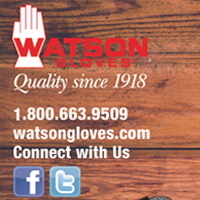 Flowers come in red, pink or white, while foliage can vary from green to variegated to shades of red or bronze. 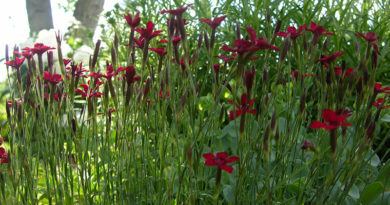 ‘Dragon’s Blood’ is the most popular cultivar with its bronze-red foliage and red star-like flowers. However, it is not as hardy as the other species and may suffer in harsh winters without snow cover. In protected areas it can be a real showstopper when in full flower. ‘Tricolor’ is also grown widely, mainly for its variegated leaves of pink, white and green stripes. The pinkish flowers are a bonus. As with any variegated leafed plant, check for reversions back to solid green and remove them as they are usually more vigorous and will take over the clump. ‘Red Carpet’ is another well-known S. spurium cultivar, sporting red flowers and bronze-red foliage. ‘Voodoo’ is a new cultivar which is claimed to be the darkest of the red-leafed spurium types; its mahogany-red leaves team up with pink flowers. 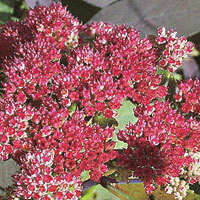 ‘Fuldaglut’ has both reddish flowers and foliage, while ‘Variegatum’ has green leaves with a creamy pink margin. 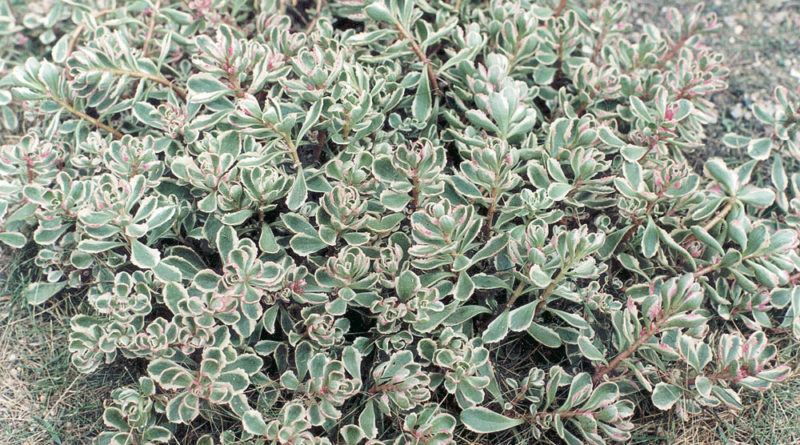 A ground cover sedum for the prairies, long proven hardy and vigourous, is S. kamtschaticum or ‘Russian stonecrop’ (also known as ‘Kamchatka stonecrop’), from the Kamchatka peninsula in Russia. 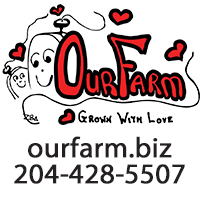 Like many other plants from this area, it is well suited to our climate. 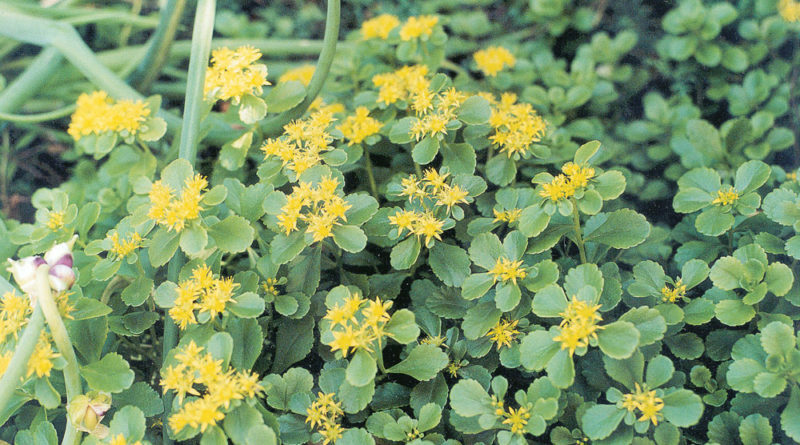 Dense green leaves form a mat, above which bright yellow flowers bloom in the summer. Leaves are more linear than the leaves of S. spurium, and are scalloped near the ends. Attractive reddish seedpods remain on the plant after flowering. 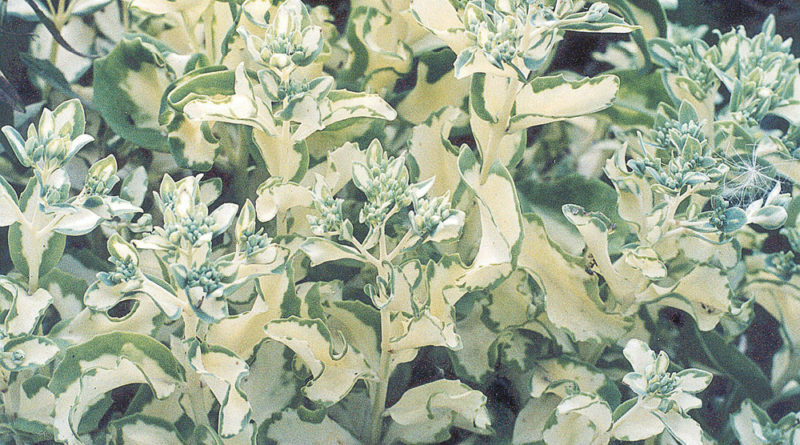 A variegated leaf (green with cream edges) cultivar is available. 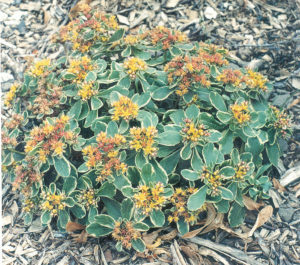 ‘Variegatum’ bears golden-orange flowers and does not spread as quickly as other groundcover sedums. Two other species, which are sometimes very similar to S. kamtschaticum and are sometimes found in the trade, are S. ellacombianum and S. middendorffianum. They are sometimes listed as subspecies. Sedum reflexum – or S. rupestre (stone orpine) – ‘Blue Spruce’ is aptly named because it looks like a thick carpet of miniature blue spruce trees. 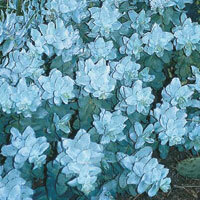 Blue-green needle-like succulent leaves are borne on upright six- to eight-inch stems. Plants are very vigourous and spread quickly to yield an attractive and interestingly textured ground cover. Yellow flowers are produced in summer. Any pieces of stem that break off will root and grow. 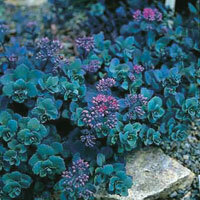 The sedums in this group grow as loose mounds or clumps. They are non-spreading. 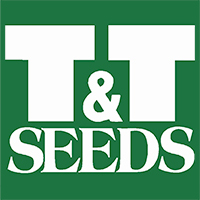 Plants can be used singly or in groupings in beds, containers or rock gardens. 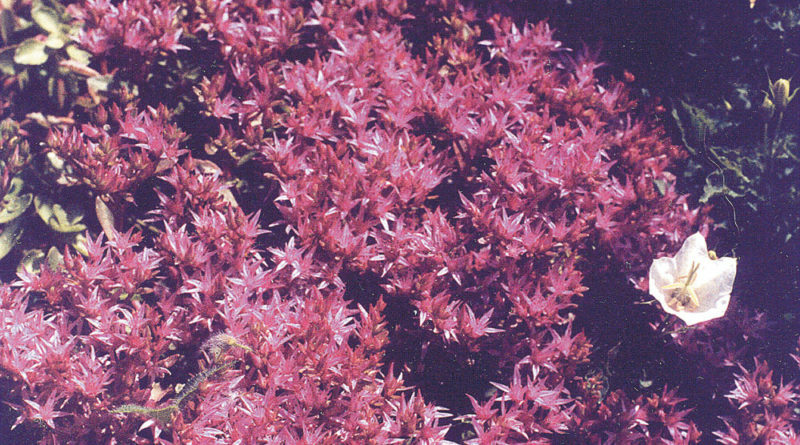 Sedum ewersii (pink stonecrop) is a very pretty stonecrop which should be grown more often. Rounded blue-green leaves, edged in maroon, complement the rosy-pink flowers produced in late summer. Native to the Himalayas and Mongolia, the plants grow six to eight inches in height. One of the finest sedums is ‘Vera Jameson’. Plants grow six to eight inches high and bear deep pink flowers in late summer. The leaves are a blue-green colour in early spring then develop into a beautiful purplish-red colour as the season progresses. It is named after an avid English gardener who discovered it in her garden, believing it to be a chance seedling between ‘Atropurpureum’ and ‘Ruby Glow’. 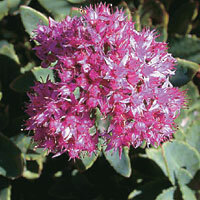 Sedum sieboldii (‘October Daphne’) is one of the latest sedums to flower. Plants bear round, blue-green leaves edged in pink and form a tight mound in spring, later developing candy pink flowers in fall. 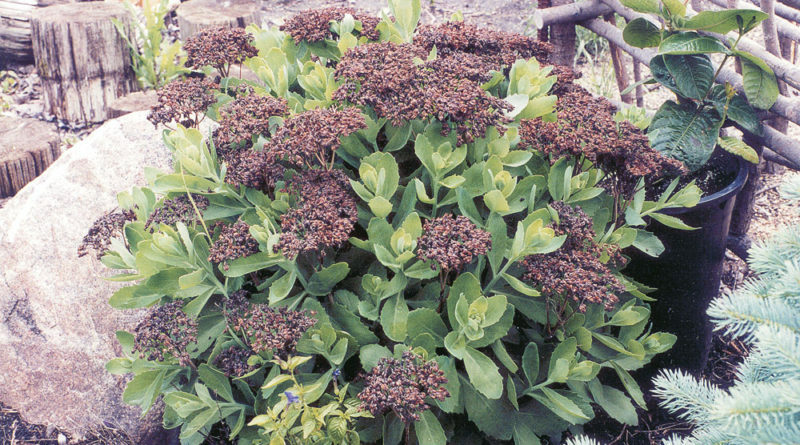 Sedum ‘Rosy Glow’ (also called Ruby Glow) grows to six to eight inches as a loose mound of blue-grey-tinged purple leaves with deep pink to reddish flowers in late summer. This cultivar may not be quite as hardy as the others we have mentioned. There are a number of medium sized, clump forming sedums which make excellent additions to the garden and commercial landscapes. They tend to grow in a more upright habit compared to the other sedums. 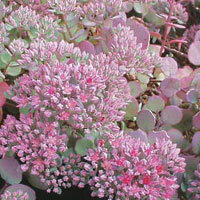 Sedum ‘Autumn Joy’ (also called ‘Herbsfreude’), developed in 1955, is the most well-known and widely grown of all sedums. And rightly so, for this perennial plant is an asset to any landscape. 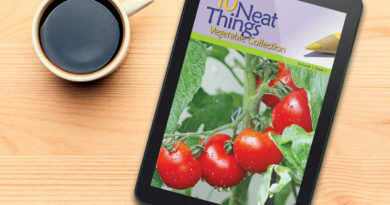 Devoid of any pest problems, plants reach 18 or 24 inches tall and look attractive in the vegetative state until buds are produced in late summer. Termed “the broccoli plant” by children due to its numerous green buds atop thick stems, not unlike broccoli, its buds gradually open to a whitish colour which changes to reddish pink touched with salmon, then into a red until finally fading to a bronze-red. 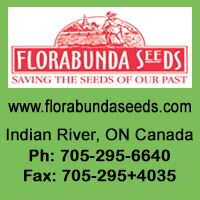 Flower heads will eventually dry on the plants, giving an interesting effect all winter. A wonderful partnership can be created with fall grasses. It is considered to be a hybrid of S. spectabile and S. telephium although it is often just listed as a cultivar of S.spectabile. 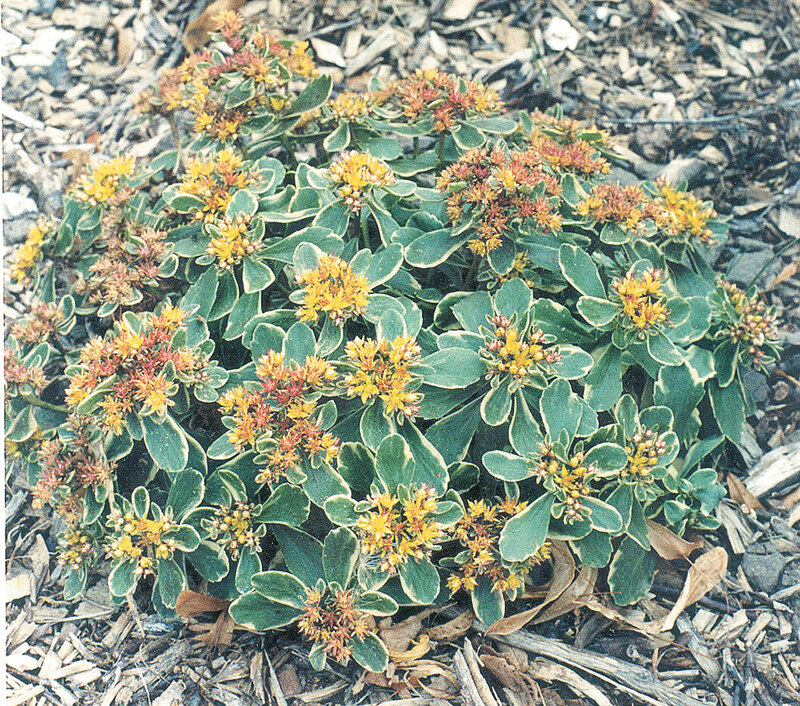 There are a few cultivars of Sedum spectabile, the showy stonecrop. ‘Brilliant’ and ‘Neon’ are similar to ‘Autumn Joy’ but with brighter, true-pink flowers tending to carmine tints rather than the salmon tint of ‘Autumn Joy’. They are best planted away from each other, as the tones do not harmonize well. ‘Meteor’ bears wine-red flowers, while Stardust has white blooms. Two variegated forms are interesting to grow. 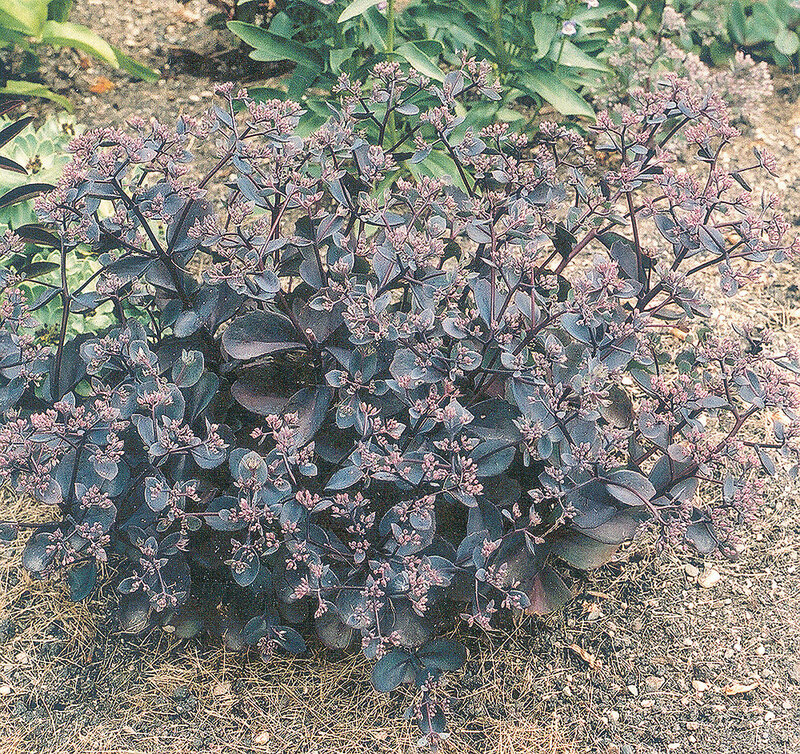 ‘Variegatum’ has yellow and green variegated foliage, which is its main landscape value, as the pink flowers don’t add a lot to the overall attractiveness. ‘Frosty Morn’, an introduction from Japan, has green leaves with a white border. Late summer blooms are light pink to whitish. 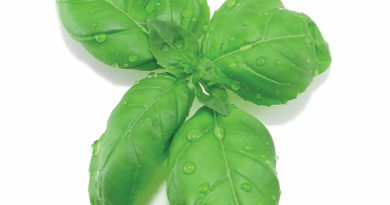 Plant can vary in height from 12 to 24 inches. 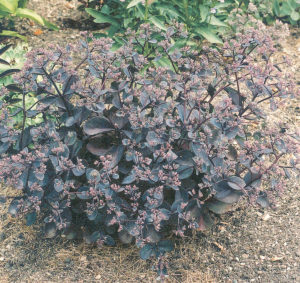 ‘Matron’, a cultivar from Germany, has strong, purplish coloured stems with grey-green leaves edged in purple. Large heads of pink flowers are produced in late summer. The German “matrone” means a lady of well-rounded form, a reference to this cultivar’s robust nature. It is a hybrid seedling of ‘Atropurpureum’ and ‘Autumn Joy’. All members of this group attract butterflies and can easily be used as cut or dried flowers. Sedum Autumn Joy surrounded by Nicotina. Angelina. 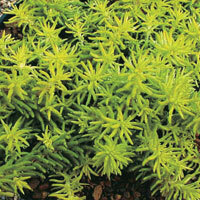 A mat-forming sedum with yellow needle-like leaves, it is like a yellow Blue Spruce. Flowers are yellow. Great to contrast with blue or reddish foliage. Strawberries and cream. How could you go wrong with a name like this? Pink buds opening to white flowers, borne in late summer on 18 to 24 inch plants. Carl. Bright pink flowers contrast well with grey-green foliage, on upright plants about 18 inches tall. Lidakense (S. cauticola), a new species for the prairies. Compact mounds of bluish foliage with pink flowers in late summer. Sunset Cloud. Plants grow to one foot with arching stems of round, purplish leaves and are likened to Vera Jameson. Mid summer blooms are russet-red. Lynda Windsor. A new, deep-purple foliage introduction from England. Ruby-red flowers are produced in late summer on 12- to 18-inch stems. Hab Grey.. New from Holland, grey foliage with yellow flowers on 12-inch stems. 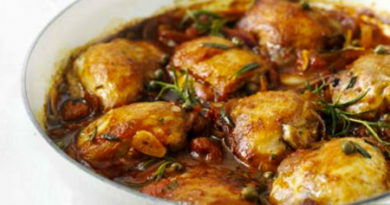 Munstead Dark Red. Very dark purple-red leaves highlighted by red flowers.